Fossil is looking to steal a bit of famous photographer Cory Richards' adventure-tinged glow for its new limited edition smartwatch. The Q x Cory Richards is a $325 Android Wear 2.0 watch, which goes on sale from 17 April. Annoyingly the flat tyre on the bottom of the screen is present - Fossil must still have a whole load of those displays to get rid of. Otherwise, considering this was designed in collaboration with an official National Geographic Explorer who has been to Southern Antartica, trekked the Russian Arctic and snapped caves in Nepal, it looks a lot like a business wrist's watch. That's because it was inspired by a Fossil Blue Chronograph Richards wore in his twenties but this does feel more Walter Mitty stuck in the office than anything. Still, it's a silver 45mm watch body and strap with a custom Fossil Blue logo and blue/black/silver digital dials on the watch face plus Richards' signature on a bundled leather strap. There is a "rugged topring" and weather/timezone/activity info upfront but not much else in the way of adventure-friendly additions that we can see so far. As for features, it's what we've seen from Fossil before - activity tracking, smartphone notifications etc. You can pre-order the Q x Cory Richards from 27 March - we're not sure how many models are being made yet. 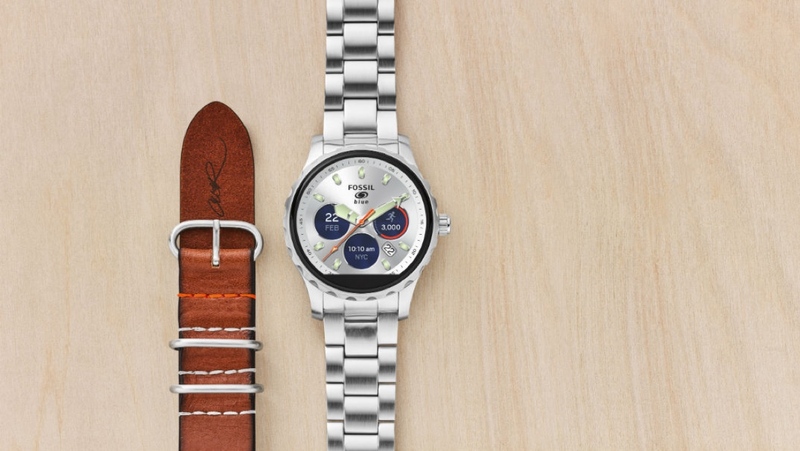 Get ready for a LOT more Fossil smartwatches this week at Baselworld.